Dickinson lies about 30 miles southeast of Houston and is one of the hardest-hit areas in Harvey’s wake. Dozens of residents were rescued by helicopter and boat from washed-out homes. Hearne and her fiancé and their two cats escaped their house Sunday morning in their Chevy Suburban, but she said the streets were impassable, and they only made it as far as the gas station down the road. They waited there, stocking up on bottled water from the convenience store, until the floodwaters started creeping past the doorway. The store closed and the couple was left stranded there by the floodwaters. “We’re just waiting and waiting,” Hearne said. 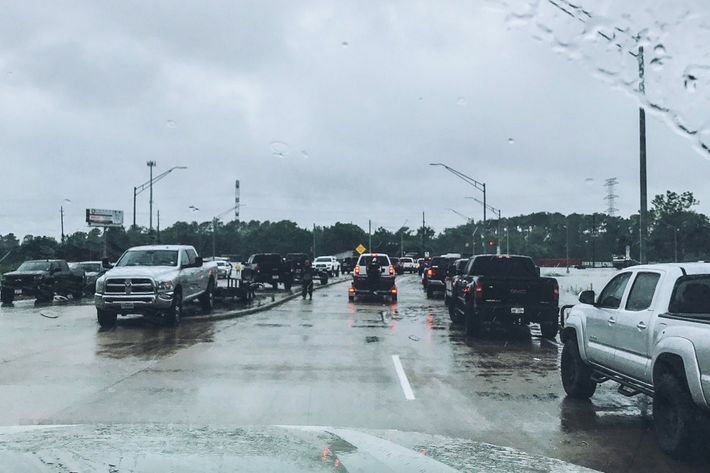 They spent nearly 24 hours hunkered down at the gas station, until her daughter’s boyfriend found a roundabout route with passable roads and retrieved them, leading Hearne and her family back to her daughter’s apartment in Kingwood, Texas. The scale of the disaster in Texas is already staggering. Hurricane Harvey smashed into the Texas coast Friday as a Category 4 storm. It weakened quickly to a tropical storm, but lingered in the southeastern part of the state for days and drenched some areas with more than (a record-shattering) 50 inches of rain. Overflow from rivers and bayous have deluged low-lying areas, and reservoirs near Houston have been overwhelmed, forcing officials to do controlled releases so the dams don’t burst. More than 30 people have died so far, a number expected to rise as authorities go door-to-door and discover who was left behind, or who got swept away. The people who rescued Castro and her family were volunteers, some of whom lived just a few miles down the road and stuck around with their boats to help. “In pouring rain, many families with children and pets packed up and made the same exit we did,” she said. Castro, her mom, and her brother are now safe at her uncle’s house. Last she heard, the floodwaters had risen as high as nine feet near her Kingwood home. 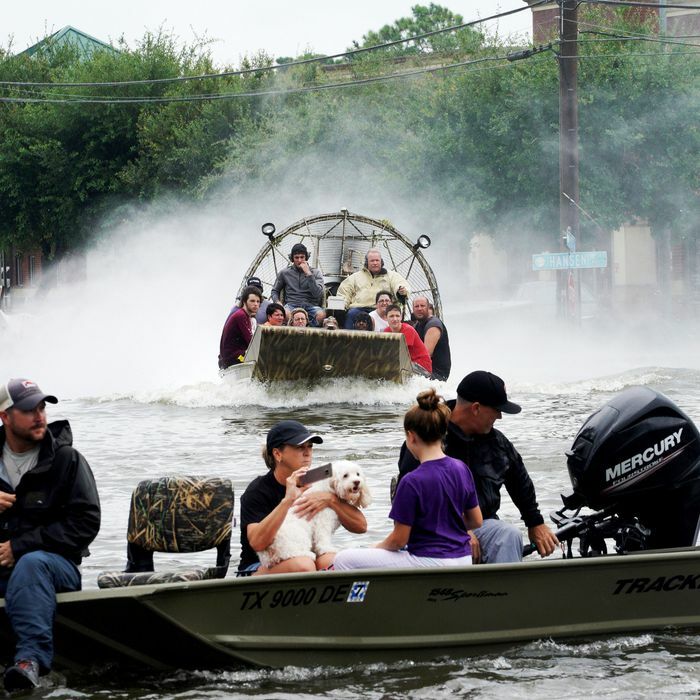 State and local agencies say at least 13,000 have been rescued so far, even as evacuations continue in Houston’s inundated neighborhoods and surrounding suburbs. About 17,000 are already displaced, and at least 30,000 people are expected to seek shelter by week’s end. Houston will get a reprieve from the rain on Wednesday, as a weaker Tropical Storm Harvey has moved and made a second landfall near Cameron, Louisiana — where it’s still expected to dump up to a foot more of rain on south and west Louisiana and eastern Texas. But the floodwaters are unlikely to retreat quickly, and when they do, left behind will be the full scope of the destruction. Hearne’s refuge in Kingwood only lasted until Tuesday morning. At 6 a.m., she awoke to find water kissing the bumper of her Suburban in the complex’s parking lot. Her family moved their vehicles to higher ground, and returned to the apartment, but the rain just kept coming and it started flooding. “We had to get out of there because it wouldn’t stop,” Hearne said of the floodwaters. “By the time we were getting out of there it was, I would say, two and a half to three feet on my legs just wading from the apartment to the truck.” Hearne escaped, this time with three other adults and five cats, to her son’s house in Houston’s the Woodlands district.